I am a choco-holic. Chocolate is one of those perfect creations-especially dark chocolate where the natural bitterness is JUST hidden with sweet sugar. Yes-I have a problem and I refuse to get help for it! You can imagine my delight when, a couple of weeks ago, I received an email from a company called Cocoa Metro-I wasted no time in reading that one! 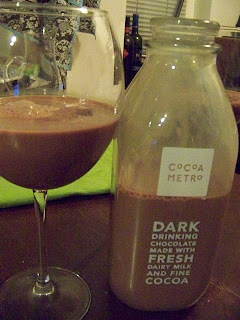 Cocoa Metro is a Massachusetts based chocolate milk company whose single product is the richest, most decadent dark chocolate milk I have ever tasted. Make no mistake-this is in no way a diet drink. Cocoa Metro is a creamy concoction -made with 2% milk, though it tastes a lot richer than that- with such a strong chocolate presence that renders almost bitter, but cut by sweetness and fullness of flavor. Others have complained of addiction to this product- and I can definitely see why. It is amazing. 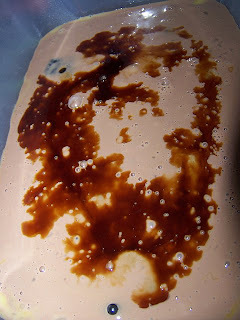 Since my brain is forever working over time to concoct new blending of ingredients, I decided to try to work Cocoa Metro into a dessert last night. 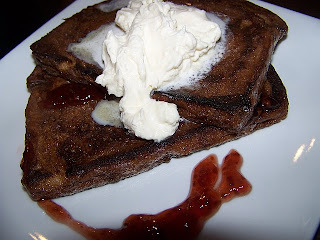 French Toast, to me, is one of those wonderful little luxuries that I just don't allow myself that often, so it seemed to be the perfect vehicle to create an incredibly decadent dessert. I picked up a loaf of just regular white sandwich bread at my grocer, and a shot of espresso when I got my daily coffee. Then, pre dinner last evening, I mixed together three eggs, about a cup and a half of Cocoa Metro, the shot of espresso and a pinch of salt. Then I place two pieces of bread in the mix side by side and let them soak it all in, flipping occasionally. After the dinner dishes had been cleared I set to work on the dessert. First things first- I made fresh whipped cream. I have to say-there is nothing on earth quite as amazing as fresh whipped cream. A cup of heavy cream, a little sugar, a teaspoon of Vanilla extract-yum. I do have to stop here and sing the praises of my immersion blender. I used it twice yesterday- one of which was to whip my whipped cream- wow- fast and efficient. What a great kitchen tool! Once the cream was whipped though- I took out my big fry pan, melted a teaspoon and a half of butter, and then placed the soaked bread in the pan. While they were cooking, I spooned two tablespoons of red raspberry jam into a small sauce pot, added a two teaspoons (or so) of Cointreau and heated them over a low heat to break down the compounds and join them into a sauce. Once the toast had browned on both sides, I placed one slice on a plate, spooned some of the raspberry orange sauce over the top, place the second slice on that, and then place a heaping teaspoon of whipped cream on top. Wow. I don't make dessert often, nor do I eat it especially often (not because I don't adore it believe me) but this was some good stuff. I could have amped up the chocolate a bit- perhaps a bit more salt to round out the flavors, and some nutmeg I think could have provided nice contrast. The espresso served mainly to give some body to the dish as opposed to impart actual "mocha" flavor, but the end result didn't suffer. Creamy and delicious with the sweet raspberry and orange sauce to provide contrast and the whipped cream there for a little relief- absolutely wonderful.